I am delighted and very proud to announce an exhibition of my work by The Sundance Institute at WNYC’s Greene Space in New York City, this Tuesday April 19th 2011. The exhibit will move for 10 days to the Museum of Contemporary African Diasporan Art in Brooklyn, New York. The View from Manda is a selection of photographs I took during the Sundance Institute's first Theatre Lab in East Africa last July in Maanda, Lamu, Kenya. I was extremely privileged to capture the finest East African theatre talent as they performed their works in progress. Here is the link to the work that will be exhibited. The participants of the Lab include the finest East African Actors, Playwrights and Directors namely Sitawa Namwalie, Mrisho Mpoto, Gerorge Seremba, Ruzibiza Wesley, Irene Sanga, Lillian Olembo, Melvin Alusa, Gilbert Lukalia. I would like to thank Christopher Hibma, Philip Himberg, Roberta Levitow, and Liesl Tommy of the Sundance Institute. In addition, I would like to extend my gratitude to H Arefe Anin, Idil lambo, Iain Harris, and Arvind Vorhora who in their own way contributed to realizing this exhibition. The purpose of the exhibition on April 19 will be to celebrate the Sundance Institute East Africa. There will be a reception to launch the exhibit followed by a short program where Philip Himberg, Producing Artistic Director, will engage in conversation with a Ugandan playwright who was an alumna of the 2010 Theatre Lab on Manda, Lucy Judith Adong. Additionally, Rwandan musicians Samuel Kamanzi and Moise Mutangana will provide musical accompaniment throughout the evening. The images provide a beautiful platform for the Sundance Institute to celebrate its initiative in East Africa. Sundance Institute East Africa supports theatre-makers in Kenya, Uganda, Tanzania, Ethiopia and Rwanda. 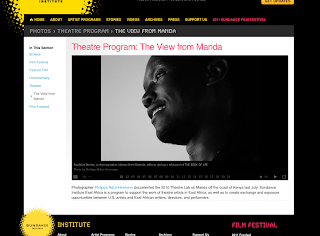 The 2010 Theatre Lab on Manda was a pilot Lab to see if the model for new play development in the U.S. was relevant and useful in East Africa. More about Sundance Institute East Africa can be found online at http://www.sundance.org/programs/east-africa/. Kindly forward this email to anyone whom you feel would appreciate attending the exhibition this coming Tuesday, or anyone who would appreciate viewing the selected images online.